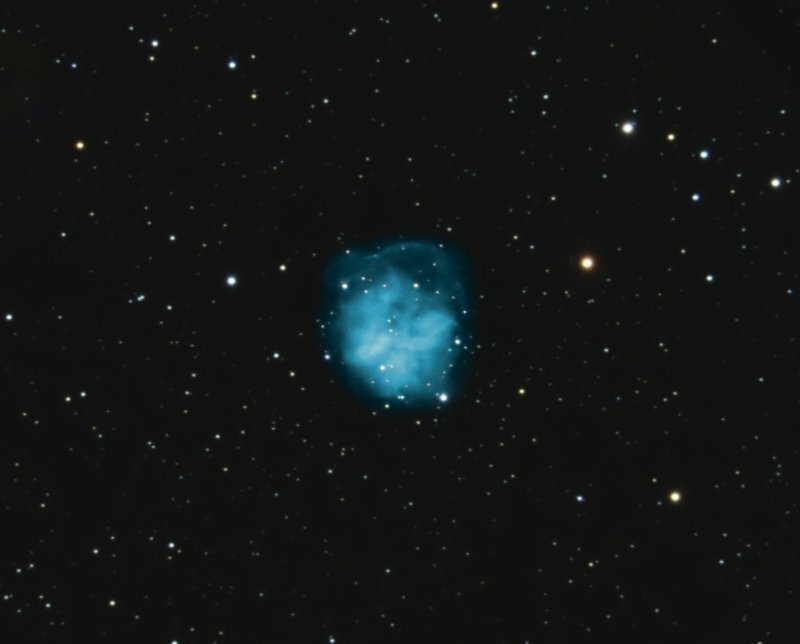 This image uses OIII for the nebula. About 14 hours of Ha was also taken, but was almost completely identical to the OIII, and was not used. The one significant difference is an Ha extension that does not appear in OIII. The Ha image can be viewed here. Exposure: Total exposure time about 12 hours; 30 x 20 mins OIII, plus 20 x 2 mins each RGB. All bin 1x1. Processing: Bias, darks, and flats. Stacked and processed with PixInsight, with a few minor modifications in Photoshop. The nebula is OIII, colorized to teal blue, and layered onto the star field in Photoshop. Wow this nebula shows up in OIII?!! Well it can't be a reflection nebula, I think it is an evolved planetary nebula!